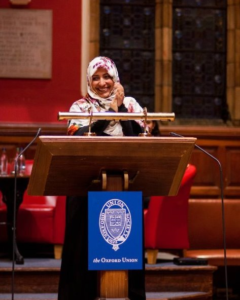 It is an honor to be at the Oxford Union, one of the most respected associations situated in the oldest, most prestigious University town of Oxford in the world. Today, I stand before you at this defining moment of history when values of coexistence, community, democracy, and human rights are under threat. These are values that humanity has longed for…for centuries, until they were codified as rights in charters and constitutions in the first half of the past century following two bloody world warsthat claimed the lives of millions of people. Today, racism, hatred, and extreme ethnic conflicts are re-emerging among a wave of terrorism that is sweeping the globe; as if the world has forgotten past sufferings and its judgement to distinguish between right and wrong! In the Arab region, the picture is much more complicated in the post Arab Spring era. Counter-revolutions following the Arab spring, are backed with international support, to crush people’s dream of a better future. I am here, to tell you, the story of the Arab Spring: the dreams the sacrifices and the consequences. Did the Arab Spring fail? Did we betray the dream? Were we on the right side of history? Did we really need a revolution? Could we have avoided the bloodshed? Was it a mistake thrusting our people in an unequal battle, with the dictators and their international supporters? I am also here to tell you about the situation in Yemen, my country. About how a peaceful revolution that gained the world’s respect turned into a fascist coup; how a militia took over the state, launched war, caused and continues to cause senseless destruction. I stand before you today to remind you ourselves, and the whole world of our cause and hooopes, for which the people went out to the streets during the Arab Spring. This is a crucial reminder at a time when the world seems to be quickly moving towards wars international powers race to garner more devastating weapons, to revive aincient imperial conflicts and intensify geopolitical tensions between countries. While marginalizing issues of democracy, freedom, human rights, and peoples’ aspirations, and their right to choose their SOVREIN. It is a universal responsibility to uphold peoples’ rights to elect their leaders, and hold them accountable, to involve the people in the political process as full equal citizens, who have rights and duties, embedded in the constitutions. To build bridges and coalitions between different countries, cultures, religions, sects, gender, and ethnicities. This is something that concerns humanity as a whole not only the Arab world. As the famous saying goes “Tyranny any-where is a threat to freedom everywhere”. Arab peoples are facing counter-revolutions threatening them with a darker future of dictatorial systems. This threatens to destabilize the entire world, and push us ALL back into darkness and violence. This is why, understanding the political struggles in the other parts of world is NO LONGER a CHOICE. Six years ago, peoples of the Arab Spring countries went out peacefully. With their free will they gathered in public squares: freedom and change squares to put an end to seemingly endless despotism, eternal presidents, and hereditary republics. Arab Spring has declared that in this part of the world, there is resilient aspiration to catch up with modernity, with the principles of democracy, justice, and human rights values. The Arab Spring has declared that the state must transform from being a tool of oppression, that kills people and their dreams, to a home where every citizen has a place, where every idea can be expressed, and every dream can be fulfilled. The Arab Spring has declared that in this region, there are people dreaming to attain a genuine democracy that vanquishes corruption, and transmits power peacefully. A true democracy! not one that masks a dic-ta-tor-ship, hierarchy, and unchecked power. Today, we are asked to make a false choice between security and democracy. This choice is presented by the dictatorships and the international powers that back them under the ruse of “War on Terror”. Under the banner of “War on Terror” they seek to revive or recreate the collapsed dictatorships through fueling: coups, wars, and sectarian militias. Failing regimes always exploit extremism and terrorism they have de-rived international backing, by claiming to fight extremist and terrorist groups. On the contrary, the Arab spring has exposed how dictators use terrorism to tighten their grip over power and crush demands for democracy and human rights. They always threaten that the alternative is terrorism. – Terrorism IS NOT part of the Arab Spring or its revolutionaries or its ideas. – The Arab Spring aspires for human dignity, justice, equality and civil and political freedoms, and the rule of law. The means to achieve that were peaceful and people were willing to give the ultimate sacrifice. When we initiated our peaceful struggle, and overthrew the heads of despotic, corrupt, and failing regimes, we inspired our people and offered a viable alternative to terrorism narrative. The Arab Spring taught us a valuable lesson – that with non-violence the journey to freedom is less bloody and more guaranteed. This lesson, almost silenced terrorism, ideologically, and practically. And This is what we have witnessed in the first year of the Arab Spring. There was not even a single terrorist attack when the peaceful movements of the people had the upper hand. It was only when, the crumbling and threatened regime sought to regain power, by hijacking the peaceful movement, staging military coups against its outcomes oppressing its people and confiscating their gains through violent counter-revolutions. Our peaceful struggle was sweeping the whole community to defeat the ideology of terrorism. Our peaceful example was abolishing extremism’s ugly practices. Our dreams and goals marched towards a brighter future. A future far removed from religious theocracy and fascism and towards a modern civil state. Our dream was that these principles be embedded in the constitutions of the Arab Spring countries. But, as you know, the dream was betrayed in Egypt, Yemen, Libya, and Syria. The revolutions and the revolutionists are peaceful, the dream is for freedom and dignity, the sacrifices are bold and reject resorting to counter violence. This is how the situation was during the early years of Arab Spring, until, the forces of coups and counterrevolutions took over. And thus came the “spring” of terrorism. But I promise you, this “spring” of terrorism or say “autumn” of terrorism will NOT last long, because our peaceful revolutions are continuing and will win soon; we will keep trying, and will never accept to be ruled again by fear and cronyism. Let me ask you this question:Who is responsible for terrorism? Don’t you see that terrorism has become more of a brand? Who is fostering and marketing it? There is an obvious link between the betrayal of the peaceful Arab Spring, on the one hand, and the expansion of terrorist groups on the other. When you establish despotisms, you establish terrorism; despotism and terrorism foster one another. Look at Syria and Egypt. The world’s in-difference to the military coup in Egypt, and to Bashar’s brutal suppression to the Syrian revolution, have fortefied terrorism. “ Al-Asad or we will burn down the country” . And that is what they did. They slaughtered an entire populationto save one man. Yet, the international community was conspicuously silent towards Bashar Alasad’ crimes. This silence has given him permission to inflict brutality on his own people. The international community betrayed and conspired against the Syrian peaceful revolution, that is what brought terrorism and violence to the country. Let me remind you, yet again, the Syrian revolution like ALL other Arab Spring countries started peacefully but Bashar Al Assad rained down upon it bullets and brutality. He created a monster called, Daesh, or ISIS to oppress the Syrian revolution and deprive it from any international cover and support. Now, This monster has turned into an ideology that is spreading around the world and multiplying like cancer. Western catastrophic failure in Iraq and disastrous invasion have fueled sectarian divisions and civil war. It left the country vulnerable to sectarian militia and Iranian meddling.This created conditions for the cancer of Daesh and all other terrorist groups to develop and spread. It is because of the oppression and betrayal of the Arab Spring revolutions and the conspiracy against them by coups and counter- revolutions. By supporting tyrannies and sustaining them with all means and tools of oppression, Daesh has come to life. So, the biggest favors the world could provide to terrorism are: propping despotism, blocking the means of peaceful change, failing to support moderate religious groups, and dealing with all as “one size fits all”. you have replaced the Arab Spring with Daesh Spring; whether you did this intentionally or unintentionally, not only that; you have also replaced the Arab Spring with the spring of Iran’s Mullahs who now control Iraq, Syria, Lebanon, and have expanded south-ward to Yemen and is still expanding. The accomplices with coups and counter-revolutions have turned our peaceful dream into bloody nightmare. Massacres in Aleppo makes us cry deeply and mourn for a long time; not only for the mass killing of civilians by the Syrian regime and its Russian and Iranian Allies, but also for our loss of humanity,, as we helplessly,, watched Aleppo’s exudes. Not only for the victims, but also for the failure to provide minimum protection to the weak and vulnerable,, which is engraved in the collective Universal Human Rights Conventions and Charter. Sadly, the international community saved the rest of the Syrian people, by forcing them out of their homes, and then, heartlessly watch them die in the sea, seeking a refuge. What a pitiful achievement! What a shameful world! They have made a mockery of basic human rights and provided political coverage for this heinous massacre, by celebrating what they’ve done and portrayed it as an achievement and a favor of the victims!! Every day, new killers present themselves. Yet some people blame the revolution. Blame the victims! This is the logic of tyrannies. I believe that, those who are to be blamed for the deterioration in Arab Spring countries are those who organized coups against the Spring revolutions, impede and directly oppressed them, or through indirect support and complies silenced. Look at the course of events and revise all details, check the stances taken by the neighbors. Certainly, you will find someone to point to as an accomplis, who decided, at this historic juncture, to be AT the wrong side of history. You will find Democratic governments that claimed to care for human rights, freedoms, and democracy, and reject any attempts to undermine them. Seeing the situation in Egypt, Yemen, Libya and Syria – and Tunis might be next – makes me feel that they wants us to be stranded in terrorism and despotism forever. Nonetheless, our belief in our peaceful struggle is stronger, we will build the state that we aspire for, a state based on justice, freedom, democracy, and the rule of law. President Trump is trying hard to deepen the impression that Muslims are terrorists, through his intensive statements, claiming that the only risk threatening the world is the so-called “Islamic terror”. Whoever brands Muslims with terror is not only lying and ignorant but he is also directly and indirectly serving the agenda of the terrorists. Such hate speech, makes it easy for the terrorist groups to recruit people and strengthen their ideologies, while undermining moderate forces. But why wonder? Trump is a fanatic! And fanatics assist each other, regardless of their religion, nationality, or political affiliation. “O you who believe! Enter into peace whole-hur-ted-ly;” (Qur’an 2:208). Trump’s policies against immigrants and refugees are discriminatory and racial as they are based on identity and religion. These policies violate International Human Rights Charters and Covenants. On top of that, these policies conflict with the civil values that define the United States’ and the identity of its people. Now, it is the time to test these values and how they can survive Trumpism. The same applies to the extra-legal drone killings, under the pre-text of “combating terrorism”, through drones that, in many cases, falls on civilians, women and children. They are not combating terrorism, rather, they are making and sustaining it with all means of survival and expansion! Global activists, intellectuals, politicians, and the media, WE ALL NEED to recall the inspiring struggles of past heroes who fought for human’s civil rights. We shall continue the march now to challenge terror, the discourse of hate, and all other animosity and intolerance. WE NEED to do that to save humanity from falling in the trap of wars and anarchy.  We have to resist war within a global struggle that advocates for coexistence, love, and peace, and eliminate any possibility of conflict between Muslims and the West on religious grounds the way that Trump’s administration is promoting. In our partnership in combating against terrorism and extremism, we shall not lose hope, and repeat the same zero-sum discourse, we will present our civilized discourse relentlessly because we recognize that despotism and terror are two faces of the same coin, feeding from the same swamp and sustaining each other. We shall combat despotism and terror together. This is our global partnership. We must fulfill it in all its complications in order to combat tyranny, support the forces of change, and dismantle terrorism by opening the door for peaceful reforms and encouraging moderate groups to popularize a moderate discourse and an ideology of religious reform. Those who ally with tyrannies, regardless of the justification, are not jeopardizing values only; rather they undermine their countries’ strategic interests, because tyrannies pose risk to the world, not to their countries only. Risks created by the tyrannies are transboundary, therefore combating despotism is not a local affair only, it is equally an international affair. Rulers will go one day, but people will remain. Reconcile with the people, not the rulers, with the liberators not the oppressors, this is the only safe way; others are mere delusions. You may want to know what happened in my country Yemen. In 2011 we launched a peaceful revolution to overthrow Ali Saleh’s regime who for three decades, turned Yemen into a private property for him, his family and his clan. It was a revolution against the state of corruption, cronyism, and failure. Our people, who own than 70 million pieces of arms, left their weapons at home to protest peacefully across the country; they faced oppression and bullets with roses and bare hands, regardless of the state’s violence, they never responded with counter-violence. Millions of people gathered at change and freedom squares for a whole year. The streets became our home. Nonviolence was our strategy. We chanted سلميه سلميهpeaceful, peaceful, until, Saleh surrendered and handed over power. A transitional period started under the leadership of a consensus-backed president and government, to lead the country into a democratic process within two years. We launched a comprehensive national dialogue where all stakeholders participated, and worked for several months to draft a new constitution that helds to the highest standards of freedom and human dignity. All stakeholders, including Houthis and members of the ousted president’s party, were involved in the process. The referendum of the draft of the constitution was a few steps away. However, Houthis militia backed by Iran and forces loyal to the ousted president Ali Saleh took over the Yemeni capital Sana’a. They disrupted the implementation of the outcomes of the National Dialogue COnference by sweeping with their arms through Yemeni cities, taking control of state’s institutions, spreading fear and chaos, and announcing the death of the political peaceful transition. Houthis militia imposed their own government headed by a member of the Houthis family and other senior officials…. After the easy shocking collapse of the capital Sana’s into the hands of the Houthis, the militia faced resistance in southern and eastern cities including Taiz and Aden. The country became an open warzone. Houthis coup backed by Iran, did not only thwarted Yemenis’ dream of change, but it has also defied all seven UN resolutions that supported the political transitional process, in addition to two other resolutions that rejected the coup and called for immediate cessation of its procedures. – An immediate cessation of hostilities in conjunction with immediate and complete hand over over of arms and weapons to the state. – In conjunction with Houthies’ withdrawal from cities they took over. – Then Houthiss need to declare themselves as a political party that seek power through political means not force and violence. – With the procedures of the Transitional Justice, we can go to the ballots to vote for the draft of constitution the Yemeni different faction agreed upon. The counterrevolution has decided to undermine the country, the region and the world. You came to this university from all over the world, British and international students. Each one of you carries your own dreams and aspirations for a better future. In Yemen, following the coup, our dream has been distorted, young people including children are forced by the Militias to take arms and fight in the war. People of the future are fighting battles of the past. However, we will not give up! The Wheel of change has moved in our countries and will not stop before ending the world of tyrannies, oppression, prisons, pride, discrimination, and corruption. This hard labor will reveal the undersurface of the fake stability that has provided justification to trade freedom and democracy by the international order and superpowers that control the international order. The Arab Spring has initiated a historic process that will not end by only removing the head of the tyranny. It is long process for reshaping our understanding of freedom, dignity, equality, state building, and to bring consensus to this new understanding. Facing the counterrevolution is just one step in the path of the public revolution that has emerged a natural outcome of the turning wheel of history that seeks no one’s permission, does not accept retreat, does not fear challenges or sacrifices. It is our eternal strife for freedom, rights, dignity, justice, and equality as manifested in one phrase “Arab Spring”. And so it has noautumn, rather it is an everlasting spring for youth’s lives that have sparked six years ago, with the first torch in Tunis. This is the law of life, struggle for self-esteem, rejecting injustice, and to adopt freedom, dignity, and human solidarity. Glory to revolutionaries who stood up for their dignity, freedom, and humanity alive or martyred, or wounded paid the ultimate sacrifice.